Our NEW Two Stage Wiped Film Evaporator and Short Path Evaporator (Molecular Distillation) Toll Distillation and Toll Processing system incorporates both wiped film evaporators and short path evaporators. Starting with lab trials in our stainless steel Wiped Film or our glass Molecular (Short Path) Evaporation systems, we generate samples for analysis and to confirm appropriate operating conditions. We customize our wiped film and short path distillation processing conditions to fulfill your product purity and temperature limit requirements. Our laboratory is equipped with a wide variety of analytical tools, including but not limited to High Performance Liquid Chromatography and Gas Chromatography. Full scale Wiped Film and Short Path Distillation pilot runs are completed after a successful separation at the laboratory level. We carry out pilot plant wiped film and/or molecular distillation tests in order to quantify the qualitative results gained from the laboratory glass or stainless steel molecular distillation or wiped film evaluation. From our pilot testing, we obtain quantitative operational data and large product samples (in the form of pails or drums of overhead or bottoms, as required for your project’s customized evaluations and market development efforts), and we collect the process information necessary to scale up to your commercial wiped film or molecular (short path) distillation process. Whether you need 100 grams or several thousand tons of product separated, our wiped film and molecular distillation facilities can accomplish your goals in a timely manner. This can be for an interim or permanent production requirement, dependent upon your tactical and strategic plan. Our quality control and auditing capabilities insure that the resultant product is produced within your specification limits. Specializing in low through high volume toll WFE and SPD distillation work. Our capabilities include specialty small scale wiped film, molecular, or short path distillation toll distillation - as well as multiple tank truck through rail car quantity toll processing campaigns. 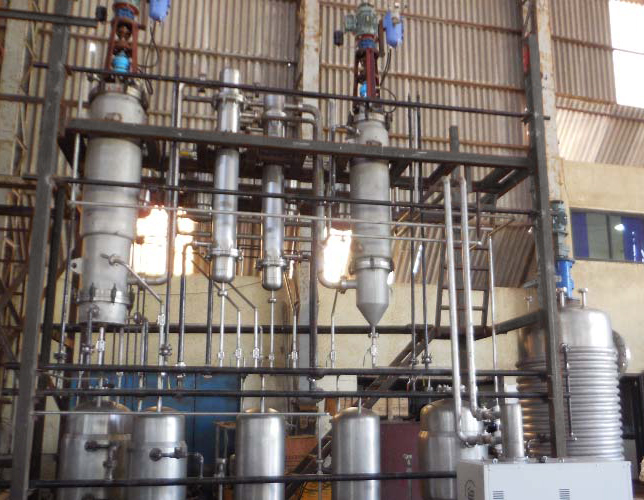 Our wiped film and molecular distillation systems can be designed specifically for heat sensitive and/or viscous products. The Vobis team has been actively engaged to design and manufacture evaporation and crystallization pilot plant systems for over 20 years to help our clients meet their goals of moving their processes from labaoratory to production. These goals vary from the generation of scale up data to producing marketing samples. Capacities also vary from a few kilograms per hour to several hundred kilograms. All photos are property of Vobis, LLC and may not be used without the permission of Vobis, LLC.